Hi, can I get your name, year, and major? My name is Ialaina Burgos, and I am in my Junior year in college. I transferred from Cypress college and now I’m here at California State University in Fullerton! I’m a Communications major with a concentration in PR. How long have you been in PRSSA and what made you decide to join? Right now, this is my second semester in PRSSA. I heard about PRSSA when I first attended the orientation for transfers. They spoke about how it’s a good organization to join, especially if you want a career in PR and gain networking opportunities. It provides you with many opportunities in order to expand your horizons so that once you graduate you will have a stepping stone into your career. Especially since I’m a transfer student and only have two years left, I felt I needed to make the best of everything available. What is one thing you look forward to in your career with PR? Some things I look forward to is learning more about PR, getting hands-on experience, and getting to put my years of hard work and studying into good use, so that I can start a stable career for myself. My favorite place to hang out would either be the library or the TSU. I really enjoy the TSU because there’s a lot of food and areas to hang out with friends or study. What other clubs or organizations are you a part of? I’m part of JCC, which is the Japanese Culture Club, and I am also a part of Circle K! Circle K is an international collegiate service club, with many opportunities to volunteer and help the community. I like to play video games! The one I’m playing right now is Persona 5, but it’s so hard to choose a favorite! I also like to watch anime, search the internet, and I really like to hang out with friends. I enjoy singing, dancing, eating, and traveling! I’m a social butterfly, so I also enjoy talking to other people. Three words would be: nerdy, extroverted, and fashionable! Out of the panels that you have been to, which have you enjoyed the most? My favorite one was Lifestyle PR, because they brought in a guest speaker from Blizzard Entertainment which is basically my dream job. I was really excited and happy to be a part of listening to everything Lindsay had to say and her transition from CSUF to where she is now. It made me so excited to realize I could be in that industry and field! Do you have any mentors or someone you look up to? I look up to my older sister, who is a really big inspiration in my life. She has accomplished so much after graduating from CSULB. She worked for Tiger, a Japanese rice cooking company, and eventually moved to Japan to teach English. She is a very strong and independent woman and has given me so much life advice over the years. Do you have a motto or personal mantra that you like to follow? Be yourself, follow your dreams and don’t let anyone else tell you otherwise because in the end it is you that matters the most. Even though you build so many relationships and meet so many people, in the end you yourself need to pull yourself through and achieve what you believe in. Thank you to everyone who attended the Halloween Mixer last week! There were some great costumes. And if you didn’t attend, well there’s always next year. This year the Halloween Mixer was held at the Grasslands Meat Market, in the GardenWalk District, located in Anaheim. Taylor loved being able to dress up and see other creative costumes. Being a transfer student, she was most excited for reaching out and meeting new people. As a transfer student myself, I thought what better way to get involved and meet other PR members than by going to the mixer. When we arrived outside the event, we were welcomed by a group of friendly, smiling faces on the board. Any fears I had about going to an event in which I knew no one went out the window. The people greeting us made me feel at ease. We got our picture taken in front of a panel that said: “PRSSA”, and were handed a couple blue tickets. Food was provided by the restaurant, with delicious helpings of pork sliders, salad, and baked mac and cheese. We even had a POP bar filled with popsicles, sponsored by the Global Results Communications, to satisfy everyone’s sweet tooth. And yes, I eventually made my way over to the makeshift bar area, and used my free drink ticket on a refreshing margarita. Inside, everything looked spooktacular. Halloween music played in the background, people danced to the beat, and others sat around and mingled with new and familiar faces. I used the opportunity to network and meet new people. We ended up talking with someone who was working on his confidence-building skills to use at the job he just got offered. He was practicing his confidence, by talking to us. If dancing isn’t your thing, there was also a fortune teller in the corner of the room. It definitely added to the ultra-spooky vibes, as he told you what your future held, based on the cards you picked. I got my fortune read. End result? I have strong beliefs that I stick by, but something may be in my way that’s holding me back. However, rest assured, I will get through it and come out stronger on the other end. Not a bad fortune, if I must say. Oh! And there were plenty of opportunities to win prizes: costume contests, mummy wraps, and raffles with some of the prizes being an Urban Decay palette, gift card to GardenWalk restaurants, Vans gift card and more. Overall, I had a great experience at the mixer. Great job to the PRSSA team for helping put this together. To everyone who couldn’t make it this year, please try to make it out next year. I promise you won’t regret it! So you’ve joined PRSSA, now what? I became an active member the Robert E. Rayfield Chapter of PRSSA just last semester and I had no idea where to begin. After attending multiple PRSSA events like the National Conference in Boston, Global Results Communications Bootcamp and every industry panel hosted at CSUF I was eager to gain some experience in the field. So… I joined a committee. I first joined the University Relations Committee in October. In my time there I was able to learn more about CICC, and I quickly realized the importance of facilitating relationships with other organizations on campus. While serving on the committee, we communicated with the other clubs on campus and prepared for our Conference, Next Generation PR. There are many skills that I’ve learned as a committee member. To put it nicely, my email skills were lacking before I joined the University Relations Committee. I checked my emails maybe three times a week, and I had no clue how to use Google Drive to its full potential. Once I joined a committee, Google Drive immediately became my best friend. My email competency and response time improved dramatically within the first few weeks alone. After some time with the University Relations Committee, I decided to expand my skill set through new tasks by joining the Outreach Committee. Though it is challenging at times, the experience of being part of the Outreach team is equally as exciting. I’ve had opportunities to network and connect with my fellow PRSSA members in new ways. From tabling at Homecoming and DiscoverFest, pitching our Chapter to communications classes around campus and preparing for Regional Conference, it’s been a wonderful learning opportunity (not to mention a great resume booster). If you want to get the most out of your PRSSA experience, get involved. Join a committee. Who knows? Maybe we’ll see you running for the executive board in April. https://csufprssa.org/wp-content/uploads/2017/12/Avatar-300x300.png 0 0 csufprssa https://csufprssa.org/wp-content/uploads/2017/12/Avatar-300x300.png csufprssa2018-02-26 22:54:222018-10-07 11:04:10So you’ve joined PRSSA, now what? 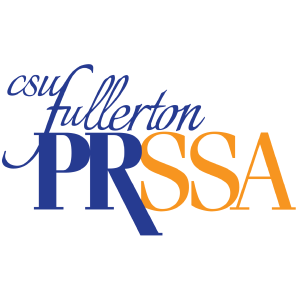 Fullerton, CA, January 31, 2018 – California State University, Fullerton’s Public Relations Student Society of America (PRSSA) hosted “Launch Your Career: PRSSA 101” on January 31, 2018 to kick-start its spring semester. For the first time ever, a student’s membership dues will be sponsored by a CSUF Alumni through a social media contest. Holly Baird joined Sitrick & Company in November 2005. Over the past 13 years, she has worked her way up the ladder earning a position as Member of the Firm. Baird hosted CSUF PRSSA’s extremely exclusive and raved about the event, Fight or Flight: Crisis Communications event last November. The sponsorship was announced during CSUF PRSSA’s kickoff event and is open to all students regardless of major. The contest requires students to participate on Twitter by answering three questions from the CSUF PRSSA twitter page using the hashtag #csufprssaXholly between Feb. 5 and Feb. 7. Applicants will need to submit a copy of their resume and a short answer of no more than 600 words on why they are the most deserving candidate and what their career aspirations are after graduation. The deadline to apply is Friday, Feb. 9. Applications are to be submitted by email to csufprssa@gmail.com with the subject line “csufprssaXholly” by midnight.